It’s winter. It’s dark, it’s cold… In short, it’s miserable outside. And there you are, dreaming of summer, sunbathing outside while drinking a cocktail, enjoying the beautiful weather. We all know that feeling! Now, thanks to CaseCompany’s tropical smartphone cases, you can picture yourself in a tropical paradise every time you grab your phone, even if it’s freezing outside! Our graphic designers worked hard in order to simulate that summer feeling as best they could. In order to do so, they selected a bunch of images that immediately evoke those feelings as soon as you see them, such as watermelons and coconuts. It’s pretty much impossible not to think of the sun, sea and beach upon seeing these two fruits, isn’t it? Add to that some palm trees and banana leaves, and you’ve got yourself a nice tropical experience! That’s not all we have, of course. There’s still plenty left to discover! 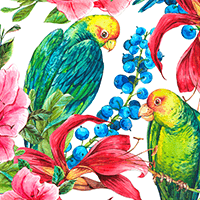 Parrots, toucans, southern plants and flowers, and even flamingos! You can put whatever you want on your smartphone case. Thanks to CaseCompany’s tropical smartphone cases, you’ll feel like it’s the middle of the summer every day of the year! Can you feel that lovely summer breeze yet?